I absolutely love pickles. And to me, the best pickles are dill pickles. I’ve been known to pick something different for lunch simply because it comes with pickles. One of the best things that the cafeteria at my workplace did was to add sliced dill pickles to the make-your-own sandwich bar. I’ve made refrigerator dill pickles in the past (meaning last year) and, while quite good (some of my friends lust after them), there was something not quite with them. Either they ended up too spicy (they had jalapeños in the) or too sweet or too sour. Or they just weren’t perfect. So I’ve started my own personal search for the perfect dill pickle recipe. I figured that if refrigerator pickles are in some sense a modern short cut, I’d go back to a natural fermentation recipe instead of only using vinegar to pickle them. I also wanted to can them so that they’d be easy to give out and would take up room in my refrigerator. Except I screwed up. I realized part of the way through preparing these to be canned that I was going to run out of brine. I do know that when canning acidity level is very important so I just mixed up some more brine as was done in the third step of the recipe. Anyone spot my mistake yet? At some level, I knew it as soon as I did. See, I added in the salt again this time. When I opened the first jar, the pickles were intolerably salty. So, if you make these and run out of brine, leave out the salt. So why did I post this? Partially, so Angela can no longer claim I only posts the successes. But I also didn’t screw up all the jars and, when I tried the pickles prior to canning, they were really quite good. Were they the best ever? I don’t know yet. I’ve already got another batch of dill pickles in my fridge fermenting away. So, if you like pickles, stay tuned as I try to find my favorite recipe. Rinse the cucumbers. Cut the ends off the cucumbers and then cut them into 1/4″ thick slices. 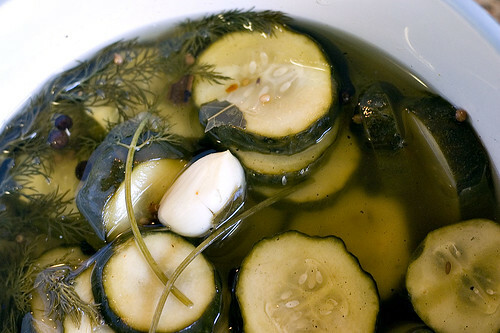 In a large ceramic, stainless steel, or glass container, place half of the pickling spice and one bunch of dill. Place the cucumbers on top. In a large stainless steel pot, add the salt, vinegar, and water. Bring to a boil and dissolve the salt. Remove from the heat and allow to cool. Pour the pickling liquid into the crock. Place the remaining pickling spice and dill and the garlic on top. Place a plate on top of the cucumbers and then a jar filled with water on top of the plate. Put the container in a cool dry place and cover it with a tea towel. 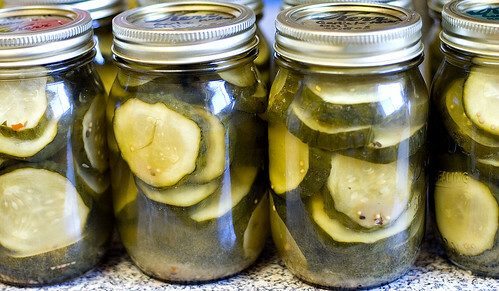 Allow it to ferment for 2 to 3 weeks or until the cucumbers have achieved a pickled flavor. Remove any scum from the top of the container every day. Prepare the canner, jars, and lids. Drain the pickles, reserving the brine, and remove the dill, pickling spice, and garlic. Bring the brine to a boil in a stainless steel pan and boil for 5 minutes. Pack the pickles into the jars leaving 1/2″ head room. Pour the hot brine into the jars to cover the pickles leaving 1/2″ head room. Secure the lids onto the jars. Process the jars in a boiling water canner for 10 minutes, allow to cool, and then store. Makes about 8 pint jars. Combine the ingredients together and mix well. Store in a sealed container.